Here's another new brainy British pop band with catchy songs - this one's called The Week That Was, and this song's called "Learn to Learn." Is it just me, or does this owe something to XTC? These guitar licks and rolling toms are right out of "Making Plans for Nigel," which I've included below for comparison and to point out that the best videos ever made are from the 80s. It's never bothered me when a band "pays tribute" to another band. Where it gets dodgy is with the Rancids of the world - a band that I really like, but that gets a little bit too close to aping the Clash sometimes. 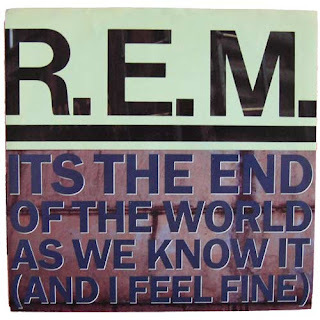 The cool thing about The Week That Was' debut album is that all of the songs are at least loosely about "the media." "How do we deal with the fragments of information we receive through the television, radio, the Internet? How do we balance the distrust we feel for mass media with our dependence on it? How does this relationship influence our hopes and actions in our real lives? And finally, what would happen if we decided not to deal with it anymore and switched off the information flow by throwing away our TVs, radios and newspapers?" And what more could a student enrolled in communications want than a band rocking out to the death of the media? Congratulations to Jason Beck, who turned 40 today, making him Winnipeg's Oldest Comic. 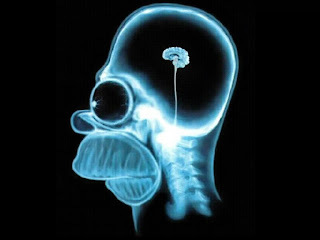 Why, he can remember a time when a McDonald's manager's picture hung proudly in each restaurant, Mcjobs were plentiful, hash browns cost just 60 cents, and Men Without Hats pins were considered cool. Actually, scratch that: they were never considered cool. I have no idea who the two losers are behind him. If you didn't get enough great CreComm work at this year's IPP Presentations, two groups of second-year Ad and PR students will be presenting their Breakfast Television campaigns this Thursday at Red River College, Princess Street Campus, in the Great-West Life Lecture Theatre at 11 a.m. (aka "the guest- speaker slot"). 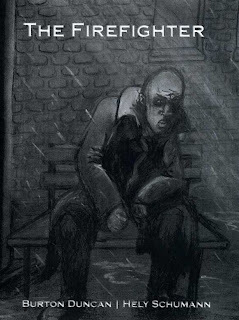 Burton Duncan puts the "graphic" in graphic novel with his IPP, The Firefighter. Day two of the IPP presentations was more rock and less talk. Another great job from today's IPP presenters - way to go, everyone! Mike Ambrose was a genial host with great shtick, and Nicole and Crystal continued to be the best event planners in the history of planet Earth. Now, if only someone would post some of the great rock from the "musical part" of today's presentations on YouTube, I'd link it to this blog. TwoTails? Van Kunder? Blazing Saddles? Let's get that up for public consumption, I say. CreComm student Dave Shorr suggested to me today that he get half of the ad revenue from this site. I'm happy to oblige: tomorrow I will present him with a cheque for $0. Har, har. See you at the last day of the IPP presentations! What is a communications professional? Choose one. Yesterday we had our annual meeting where we pitch our "majors" to first-year CreComm students, who have to decide on a specialty for second year. Their choices: journalism, broadcast, advertising, or PR. Which would you choose, given the current economy and media climate? Ad and PR: evil? Maybe. Adaptable? Yes! If a job is your ultimate goal, I'd go with advertising or PR, (disclaimer) and not just because I teach them. The late comedian Bill Hicks had a great shtick on advertising and marketing (see video above), in which he slams marketers for being so darn "adaptable" to every situation. I agree: marketers always win. Show them new media, and they'll find ways to get money out of it before anyone else. As Hicks says, you'll sleep soundly at night knowing that your job manufacturing "arsenic childhood food" is safe and secure! Funny guy. There will always be students who select journalism, job market be damned. I was a journalism major myself, so I know what that's about. Journalism always has the edge in the classroom setting: if you have a notepad and sources, congratulations: you're a working journalist! The bigger problem today: after chasing and writing the story, how do you get paid for doing it? I often use the example of my 18-year-old nieces in class. They go to the Franz Ferdinand concert, shoot video on their cell phone, post it on YouTube, and write a review on Facebook. They do it for free, and it's viewed by everyone at their school. Are they journalists? There are some who believe that what they've done is actually more valuable than the classic "newspaper sends a critic with a luxury-box view" scenario. And, as long as my nieces - and all of their friends - are willing to do it for free, price is on their side. Yes it is. Broadcast: is amateur the new professional? For years, TV sustained the aura of being something very special, important, and glamorous. "Motion and emotion!" as we say in class. And we, the passive viewers, let it be so. Everyone bought into the ideal of TV as a professional's medium, which made work easy for broadcast journalists and gatekeepers alike. "You're a reporter for the television? There will be no charge for that drycleaning, Ms. Kuzyk." But now, TV is really only glamorous for people "of a certain age," who probably still remember when CBS was called "the Tiffany network." What could be less glamorous than working for CTV, CBC, and CanWest Global when they're all in various stages of "not existing?" I wrote about the broken broadcast model here. Arguably, there is no such thing as broadcast anymore. It's all "narrowcast," baby: the idea is that traditional broadcast media's audience has fragmented so much, it's no longer possible for media outlets to be all things to all people. Now, it's easier to make money by targeting a narrow demographic and then sell space to advertisers who want to target that demographic. Gone are the days when we all watched "the Wizard of Oz" on Sunday night because that was the only thing that was on for "that demographic." But what if the 18 to 24 year-olds (the most desirable demographic to advertisers) don't watch TV anymore and are instead online, talking on cell phones, listening to iPods, and playing Xbox? And what if this demographic finds that the amateur videos on YouTube are more fun to watch than the latest episode of House on CBS? For me, choosing one of the above majors is a Sophie's Choice-like scenario. Given that the current communications landscape is morphing into something altogether new, I think that it's more important than ever for students to be good at "everything;" indeed, they'll need to be a communications army of one - adaptable to wherever new media takes us. As a result, educational institutions, instructors, and students will need to push aside the "choose one" model and move toward an "all-of-the-above" or perhaps even an "everything but the kitchen sink" approach. In the great movie, Diner, Mickey Rourke is asked to choose: "Mathis or Sinatra?" The correct answer to Ad, PR, J, or Broadcast? "Presley." Ron Robinson (who can do no wrong in my book after hosting CBC's groundbreaking Nightlines radio show) has a well-written review of a new book about David Ogilvy in the Winnipeg Free Press. 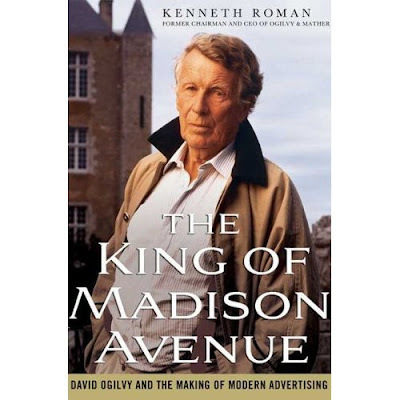 The book, "The King of Madison Avenue: David Ogilvy and the Making of Modern Advertising," is written by Kenneth Roman and available through Amazon here. Ogilvy, of course, is the British advertising guru who espoused rigid rules about how copywriters should write ads. Though many of his rules are debatable ("Don't be a clown! "), there's a reason why people are still talking about him some 50 years after he did his best work. Ogilvy wrote some classic ads, including Rolls-Royce's print ad with this very long, but effective, headline: "At 60 Miles an Hour, the Loudest Noise in This New Rolls-Royce Comes from the Electric Clock." 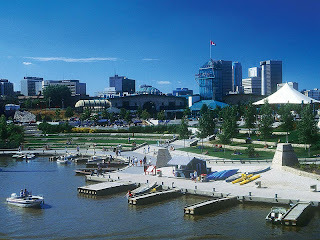 "(Ogilvy's) new boss was the former Winnipegger, William Stephenson, aka Intrepid. Ogilvy rarely spoke of his work, honouring the Official Secrets Act, but Stephenson said of him, "literary skill, very keen analytical powers, initiative and special aptitude for handling problems of extreme delicacy ... David not only made a good intelligence officer, but he was a brilliant one." Sounds like a great summer read. While you're at it, make sure you read Ogilvy's classic books, On Advertising, and Confessions of an Advertising Man, if you haven't already. Then remind yourself, "Rules are made to be broken."